WASHINGTON, D.C. — In South Sudan, where the United Nations has declared the world’s first famine since 2011, IMA World Health and Lutheran World Relief are collaborating to set up and run lifesaving medical centers that will treat young children at risk of starving to death. 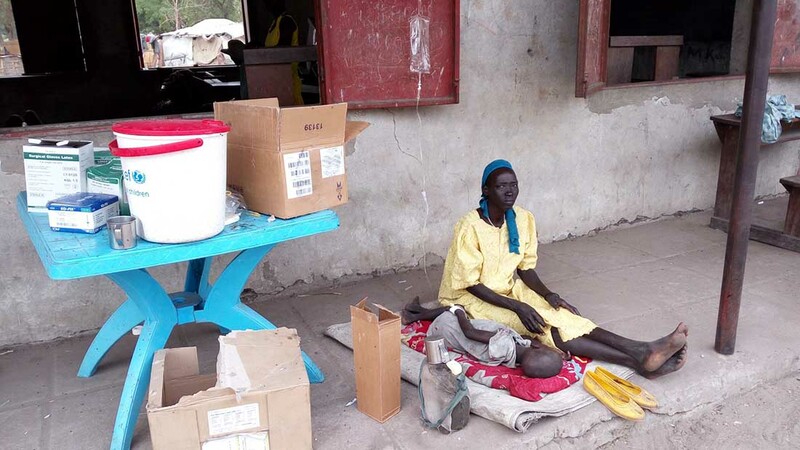 IMA World Health and LWR will run three treatment centers, in the Great Upper Nile Region of northern South Sudan, in areas where there are no other emergency medical facilities. The project will focus on children under 5 who are so severely malnourished that they are near death. Many of these children are also suffering from malaria or diseases causing severe diarrhea, which exacerbate malnutrition. Children and mothers nursing infants will receive 24-hour care until they are disease-free and the children reach a healthy weight. The treatment centers will serve an area with a population of 290,000, of whom an estimated 4,200 are currently suffering from severe malnutrition. Another 11,000 people are believed to be moderately malnourished. IMA and its partners manage comprehensive nutrition programs including; a Stabilization Center, an Outpatient Therapeutic Program, a Targeted Supplementary Feeding Program and an Infant and Young Child Feeding Program. In the region targeted for this partnership, drought fuels a severe food crisis, compounded by a civil war that has killed 50,000 and displaced nearly 2 million people since December 2013. IMA World Health has been a key partner in addressing South Sudan’s health needs since 2008, working closely with the nascent government’s Ministry of Health, civil society, donors and other critical partners primarily on health systems strengthening, malaria and HIV/AIDS interventions. As an IMA World Health member agency, LWR brings significant agricultural and livelihoods development experience to the partnership. Founded in 1960, IMA World Health is a faith-based agency that helps vulnerable communities to address their public health challenges. Based in Washington, D.C., IMA World Health operates in six countries to help strengthen health systems; address communicable diseases such as HIV, malaria and others; eliminate sexual and gender-based violence and support its survivors with the goal of ensuring health, healing and well-being for all. PRODUCERS/EDITORS/REPORTERS: Interviews with local staff in South Sudan are available. Contact us for more information. Read the full emergency appeal here. Nearly 5 million women, children and men are at immediate risk for starvation following the World Food Programme’s declaration of a famine event in South Sudan. Regional violence and climate change have affected the ability of people in the world’s youngest country to raise livestock, farm vegetables or harvest grains. With an estimated 1 in 4 South Sudanese in need of immediate help, many – if not all – traditional methods of achieving food security have been thwarted. More than 2 million people have fled their homes in response to violence, complicating existing efforts to provide emergency feeding and other humanitarian services, such as medical care. As the situation worsens, there is additional concern for compounding public health problems such as cholera. IMA World Health has extensive experience working in high-risk environments and has been operating in South Sudan since 2008. It is one of the few international health service delivery organizations continuing to address critical needs in South Sudan. Operating primarily in Jonglei and Upper Nile states, the agency has worked with the South Sudan Ministry of Health, World Bank and other partners to provide clinics and other points of access to basic medical services to about 25 percent of the country’s population, despite ongoing challenges of violence and instability. Please join us by offering your life-sustaining support.